Statues ready to be filed with mantras rolled by Ven. Jan Bijman (Konchog Phuntsok) at Maitreya Instituut, Amsterdam, the Netherlands. Photo by Ven. Jan Bijman. Each month Maitreya Instituut, an FPMT center in Amsterdam, the Netherlands, organizes a mantra rolling activity facilitated by Ven. Jan Bijman (Konchog Phuntsok). Students learn about and roll mantras that they can then use to fill their own statues and stupas. Greg Suffanti, a long-time student and Maitreya Instituut volunteer, shares the story. 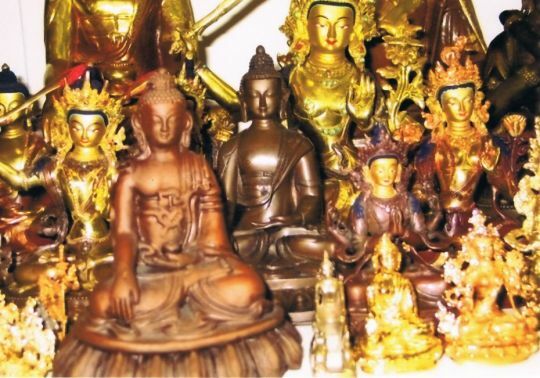 In 2019 Maitreya Instituut will celebrate its fortieth anniversary, making it one of the oldest Buddhist organizations in the Netherlands. I’ve been a student and a volunteer at Maitreya Instituut’s Amsterdam center for nearly twenty years, and all through the years I’ve had the pleasure of knowing the very quiet and modest Ven. Jan Bijman. Ven. 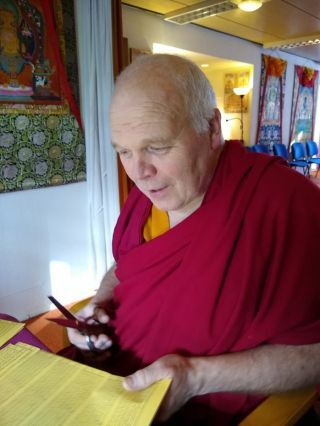 Jan Bijman (Konchog Phuntsok) holding a sheet of mantras, Maitreya Instituut, Amsterdam, the Netherlands. Photo courtesy of Maitreya Instituut. Ven. Jan began rolling mantras back in 1983, when he went to live at the center, then located in Bruchem. Today, Maitreya Instituut has two centers: a large retreat center in Loenen and a small city center in Amsterdam. Ven. Jan took refuge with Lama Yeshe in 1982 and took ordination on December 28, 1988. Ven. Jan was quick to add, “Geshe Lhundrup first helped me, as well as Geshe Sonam Gyaltsen.” Geshe Sonam Gyaltsen is Maitreya Instituut’s resident geshe. There are many tasks and rituals involved in the process of filling a statue—from copying the mantras on to paper, which has to be dyed saffron yellow—to carefully cutting out the individual mantras on a single sheet, then rolling each one tightly around a stick of incense, to then bundling the incense in saffron colored cloth. We are fortunate at Maitreya Instituut that so many people like Ven. Jan have selflessly given their lives to help keep the two centers alive and thriving for forty years. This is quite remarkable in this day and age.